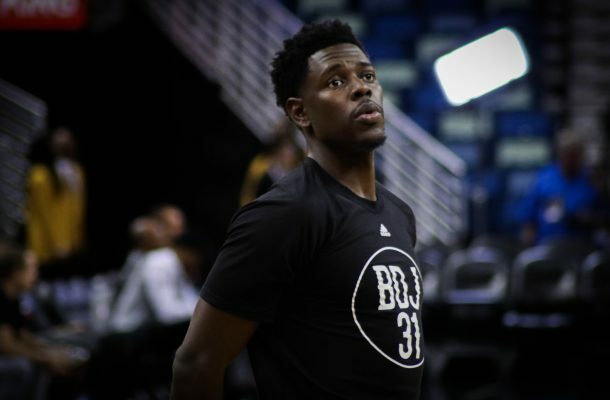 Jrue Holiday and his role with the New Orleans Pelicans has been a hot topic over the past two months. But let me be clear on one thing: in a vacuum Holiday leaving will hurt the Pelicans. The offense should be alright—especially with Holiday’s role changing to be that of a spot up shooter—but the other side, defensively, is where his loss could create a greater impact. The Pelicans greatly improved their defense this season ranking as the 9th best in the final rankings. This was largely behind the switching scheme implemented by Darren Erman. Offensive player sets a pick? Just switch assignments. Though Solomon Hill has his faults on offense, his ability to guard multiple positions really unlocks the defense. Another guy who can guard multiple positions is Jrue Holiday, but not in the way you might think. He can guard any point and shooting guard in the pick and roll as evidenced by Holiday allowing opponents to only score on 38.4% of ball handler opportunities. But the most dangerous man in the pick and roll is the screener. How does Holiday fare there? His 6 foot 4 inch frame and strong center of gravity give him the ability to defend bigs. Holiday only allows opponents to score 37% of the time as the defender of the roll man. That is the positional versatility the Pelicans have craved. Most teams don’t switch 1 through 5 on the pick and roll, but the Pelicans have been able to this season. So the defense will obviously take a step back next season if Holiday leaves. But if he resigns there is a good chance it will regress a bit as well. This centers (see what I did there?) around DeMarcus Cousins. Cousins is a solid defender, but at times struggles in the pick and roll on a switch. If the Pelicans want to compete for a playoff spot next season they cannot let themselves get killed in crunch time this way. This will necessitate a slight change of scheme. When the pick and roll is run at Cousins the Pelicans will need to ICE, hedge, or trap the ball handler instead of switching. This requires the defense to communicate and use their basketball IQ’s. That was upgraded this past offseason, but losing Holiday at the point of attack will cause everything to take a step back. Holiday is due a potentially huge payday, and I’ve been against a max deal because of his role on offense. But we cannot forget about the defensive impact as well.